That dash! That new full-colour, all-digital dash! 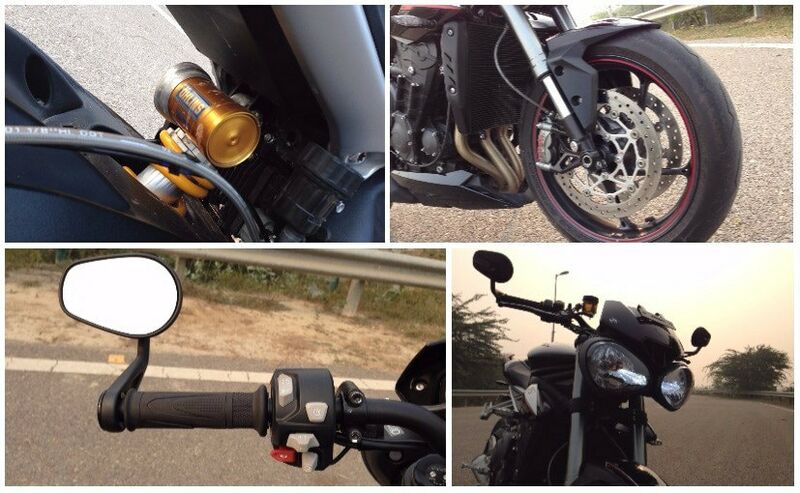 That’s the party piece of the new Triumph Street Triple RS. And the tachometer is hitting around 7500 revs, but I have just a fraction of a second to glance down, the front wheel lifts up ever so gently, and as I close the throttle, quickly shift into third without the clutch, and again give a handful of throttle, the bike seems to behave like an overenthusiastic young colt, rearing up again, ever so slightly on the rear wheel. Thankfully, the electronics ensure there’s no drama; the superb traction control quietly brings back things to mother Earth, and my overenthusiastic right hand is kept in control. 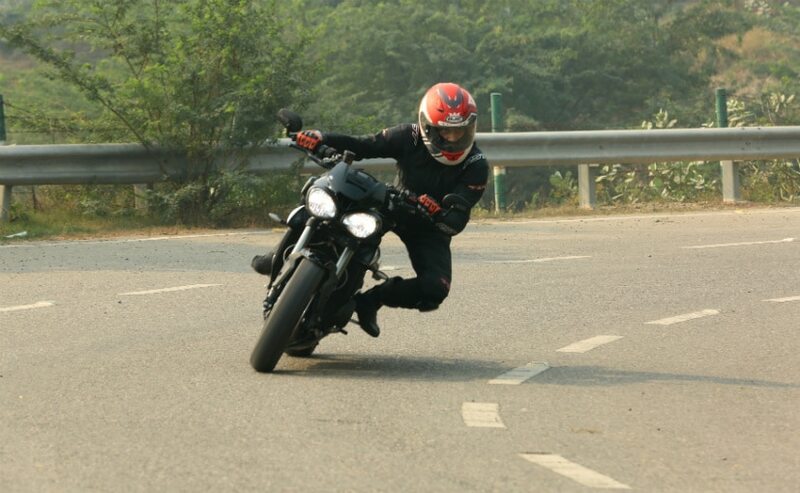 That, ladies and gentlemen, is what the new Triumph Street Triple RS can do, without you, the rider, even trying too hard to do anything dramatic. So, it’s quite the performer then? The RS has the same 765 cc in-line three cylinder engine of the Street Triple S, the base all-new Street Triple, but there are some changes. The RS makes over 121 bhp of power at 11,700 rpm. For comparison, that’s a full 10 bhp more than the base Street Triple S. And the RS also makes 77 Nm of peak torque at 10,800 rpm, that’s also 4 Nm more than the S, and all that pulling power of the RS is available over a wide range of revs, so it’s more eager to pull from as low as 4,000 rpm. 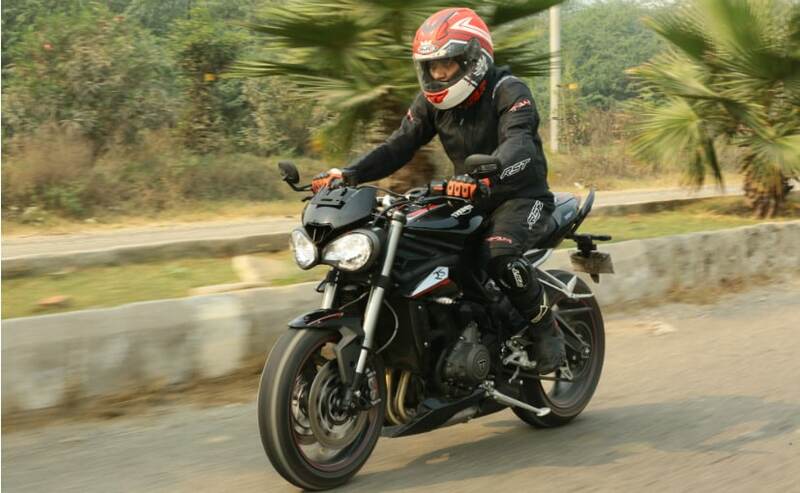 And once you cross 7,000 revs, the RS comes into a different element altogether, and let us warn you, public roads are no place to explore and get familiar with the full range of the capabilities of the new Street Triple ₹ Within seconds, you will reach unmentionable speeds, and one mistake, yours or somebody else’s, could well end up in disaster, and tragedy. Thankfully, the brakes offer superb bite and feedback. The Brembo M50 four-piston radial Monobloc calipers gripping twin 310 mm discs at the front, and a Brembo single piston sliding caliper gripping a single 220 mm disc at the rear, rapidly shed speed. The ABS works like a dream and there’s no drama, no “oh my God!” moments when you decide to decelerate to saner and safer speeds. The 41 mm Showa upside down big piston forks have more travel than the Street Triple S’s front forks, so there’s noticeably less dive under hard braking and the front end feels more taut and communicative on the RS . The 17-inch wheels at both ends are shod with Pirelli Diablo Supercorsa SP tyres, and grip levels are excellent, under hard braking and even when leaned over on a curve. But how does it handle Indian road conditions? The Street Triple RS doesn’t yet get semi-active suspension with an inertial measurement unit, or the like, but it still gets high-quality suspension. The Triumph Street Triple RS has been designed with making it track-ready. So, the suspension set-up is on the firm side. 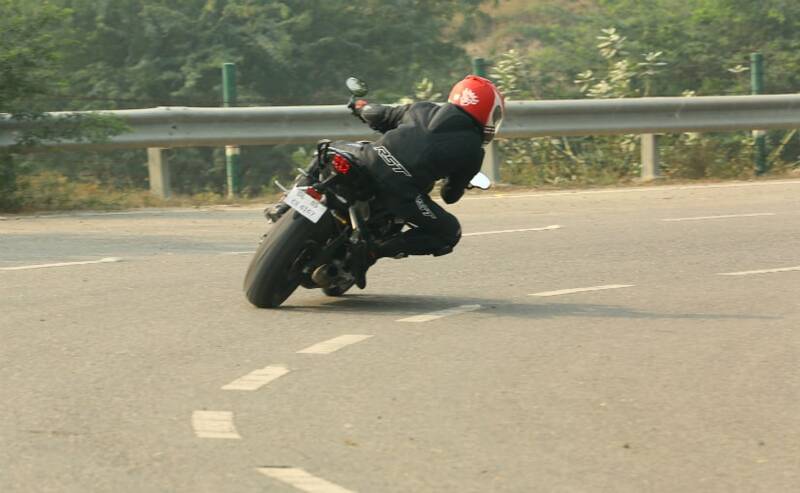 It’s not harsh or uncomfortable on the roads we were riding on, but you can still feel road undulations prominently. So, maybe bad roads and the RS may not be such a good idea after all. The Showa Big Piston Forks and the Ohlins STX40 shock offer some adjustability, but setting up the suspension in just the right manner is easier said than done; make it too plush, you lose some of that taut handling, and make it too harsh, and you’re in for a hard time negotiating the daily commute through broken patches, speed breakers, potholes and the like. Did we say commute? 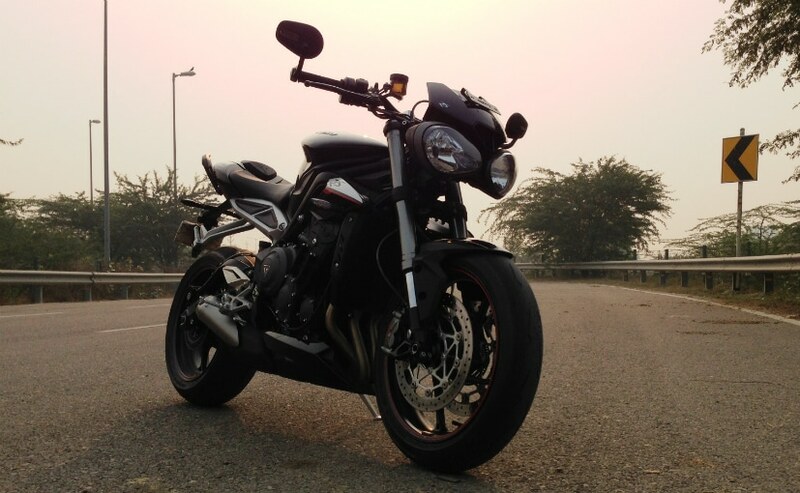 Yes, the Street Triple RS can be flicked through traffic with immaculate ease; it’s like a point and shoot camera. The suspension, chassis and swingarm work in tandem to give a superlative riding experience; just a nudge on the handlebar and it obeys your each and every small input like it’s reading your mind. It’s that good! But that sharp handling has always been the Street Triple’s forte; it’s there in the last generation Street Triple, it’s there in the all-new Street Triple S, and it’s got spades of it in the Street Triple RS, thanks also to the revised steering geometry, and better suspension. The RS has a slightly sharper front end than the S, and that shows in the way it slices through gaps in traffic, and through a set of corners. This is one naked which has near perfect handling, and that is always something very, very welcome. What about electronics and rider aids? 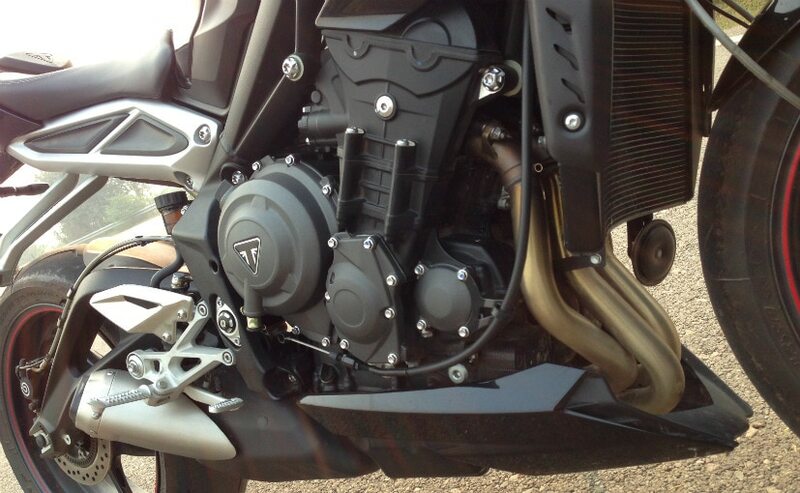 The Triumph Street Triple RS is loaded with electronics. There’s ride-by-wire, and a choice of as many as five different riding modes – Road, Rain, Sport, Track and a programmable Rider mode. And each mode can be further customised in the level of traction control or ABS intervention. And both can be completely turned off if you want to indulge in some edge of the seat shenanigans, but with all that power on tap, it’s best to leave some electronic intervention on, just in case. 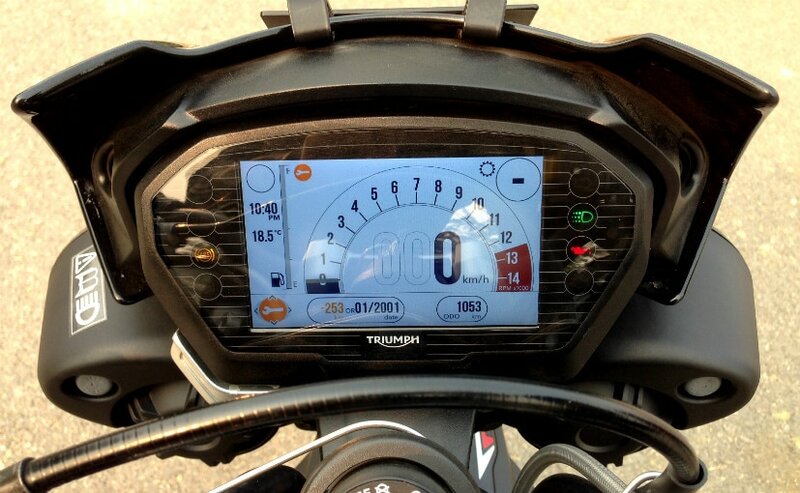 But then, you can’t change any of the TC or ABS settings while on the move; and shifting between modes also require a stop to scroll through the menu on the full-colour TFT dash, which by the way, is very intuitive indeed. The display offers multiple themes and styles and the left switchgear houses a joystick button which makes it quite simple to toggle through the menus. So, should you buy it then? If you’re willing to spend around ₹ 10.55 lakh (ex-showroom) on your motorcycle, and you’re looking for a compact, easy to handle, feisty performer, by all means take a good look at the Triumph Street Triple RS . You can do the daily commute on it, very well have your weekend dose of adrenaline, and can certainly do some long distance touring as well, as long as you stick to proper highways with good surface. And if you’re a track junkie as well, the Street Triple RS has enough performance and more to keep you entertained and at the same time improve your riding skills. The only drawback is it’s still a naked, so the wind blast will make you feel like you’re going faster than you really are, and when you begin exploring the top end at a racetrack, that will certainly get to you. And of course, it’s not a good looking motorcycle in the traditional sense; opinion is still polarised about those bug-eyed headlights. The LED DRLs do look nice, if you ask me, and the design is something you may not find pretty, but it’s not a bad looking motorcycle at all. 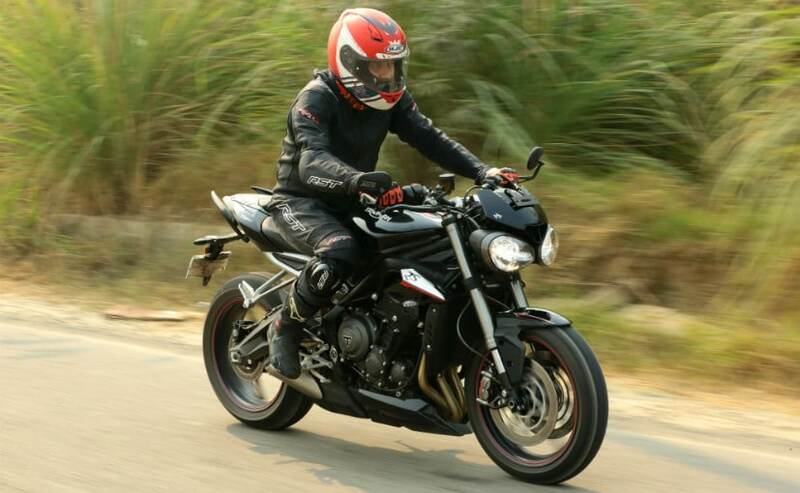 Eventually, the Street Triple RS is one of the best roadsters your money can buy right now. We certainly had a whole lot of fun with it, and if it’s pure fun you’re looking for, by all means, go ahead, take a test ride!